RMS Beauty is an original, pure and organic color cosmetic line created by celebrity makeup artist Rose-Marie Swift. Based on living and organic principles, each RMS Beauty product is formulated to hydrate and illuminate vital, radiant skin. Consider it skincare with mineral colors. RMS Beauty gives makeup a whole new meaning. And some of the most famous faces including Gisele Bunchen, Miranda Kerr, Demi Moore, Sophia Coppola, Celine Dion, Milla Jovovich, Zoe Saldana and many other stars. Her work has been featured in the most prestigious magazines like Vogue, Harper's Bazaar or Elle and her make-up has appeared on the work of some of the top fashion photographers in the world including Hedi Slimane, Peter Lindbergh, Annie Leibovitz or Terry Richardson. An impressive portfolio that is up to Rose-Marie Swift's talent. Unfortunately she turned out to experience some serious health issues caused by toxic levels of heavy metals in her blood. Aluminum, barium, cadmium, lead and mercury as well as high levels of other chemicals were causing many problems physically, mentally and emotionally. During all the years she has been working in the beauty industry, Rose-Marie had no idea that cosmetics may contain this kind of ingredients and that they could contribute to serious health issues. She then created the website www.beautytruth.com to dispel beauty myths and expose some of the dangers of personal care products. As she knows first-hand the price our health can pay in the pursuit of beauty, she wanted to help other women claim their right to healthy beauty. After years of rebuilding her own health, she also created RMS Beauty, her own line of organic color cosmetics to keep on living her passion for make-up. Today, Rose-Marie continues to work in the fashion industry and using RMS Beauty products on some of the world's most famous faces. RMS Beauty is a cosmetics line that is as pure as possible, one that creates a solid foundation for anti-aging and long-term beauty. All products are formulated with raw, food grade and organic ingredients in their natural state, allowing their living, healing attributes to penetrate and rejuvenate the skin. That's why RMS Beauty products are not only non-toxic, but that they actually heal and nourish skin. RMS Beauty breaks away from the pack of natural cosmetics using ingredients that are not refined, bleached, deodorized, clarified, fractionatedor heated to high temperatures to keep all nutrients and healing properties alive. Enzymes, vitamins, antioxidants are used in their raw, purest form so that their healing properties remain fully intact, encouraging amazing potential for anti-aging effects. All RMS Beauty products are of course free of harmful chemicals, synthetic preservatives, synthetic vitamins, and genetically modified ingredients (GMO) etc. RMS Beauty is full of healing and living nutrients as only real nutrients interact… anything alive interacts. RMS make-up works synergistically with the skin, packed with precisous ingredients that are carefully chosen to create a dialogue with the skin and promote hydration, softness, and luminosity. What will you find in your rms beauty MAKE-UP products ? RMS Beauty products exhaustive ingredients list is proudly reported, because they have nothing to hide. 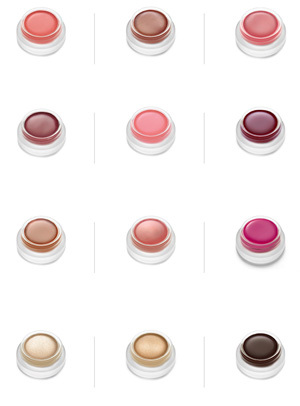 RMS Beauty products are GLUTEN FREE, GMO FREE, SOY FREE, NANO FREE and NO TESTED ON ANIMALS. RMS Beauty products are free of harmful chemicals, synthetic preservatives, synthetic vitamins. 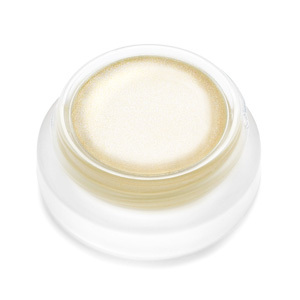 RMS Beauty products color cosmetics are packaged in recyclable glass with an air tight aluminum recyclable lid....not plastic. RMS Beauty products are packed with healing and living nutrients with their own unique qualities so they might differ at various times of harvest/production but will always have the same healing and nourishing qualities.